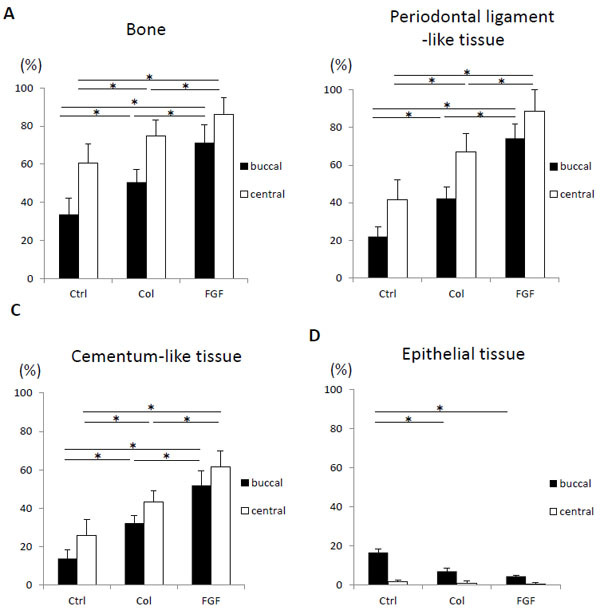 In tissue engineering strategies for periodontitis, cellular proliferation and differentiation should be facilitated in order to regenerate alveolar bone and functional periodontal attachment [1-3]. Scaffold implantation therapy plays a significant role in repopulation and differentiation of stem cells and extracellular matrices when periodontal surgery is performed, resulting in a periodontal regenerative effect. Hydrogels generally consist of synthetic and naturally hydrated polymers, and exhibit physical and biological properties . A range of hydrogel scaffolds, such as alginate , hyaluronic acid , chitosan , collagen  and gelatin  have been used in recent studies. After implantation of these substrates into the body, good tissue compatibility and degradability were frequently shown. Hydrogel scaffolds show promise for use in periodontal tissue engineering. Recently, type I collagen hydrogel was prepared by an ascorbate-copper ion system  and its bio-safety was confirmed in animals . In particular, cell ingrowth and subsequent self-assembly organization were frequently demonstrated on collagen hydrogel application. Kosen et al. and Kato et al. revealed that implantation of a three-dimensional scaffold, composed of collagen hydrogel and sponge form, facilitated periodontal healing, including reconstruction of the periodontal attachment apparatus. Consistently, periodontal adverse effects, namely, root resorption and ankylosis, were not observed with collagen hydrogel therapy. However, the volume of regenerative periodontal tissue was about half of the experimental defect. Thus, a combinatorial approach for tissue engineering is needed to stimulate periodontal reconstruction. Collagen hydrogels reportedly possess water absorption properties ; therefore, collagen hydrogel scaffolds may serve as a carrier of aqueous signaling molecules. Fibroblast growth factor-2 (FGF2) stimulates proliferation of vascular endothelial cells  and fibroblasts , promoting wound healing . In addition, FGF2 positively modulates osteoblast differentiation , bone formation  and periodontal healing [19, 20]. 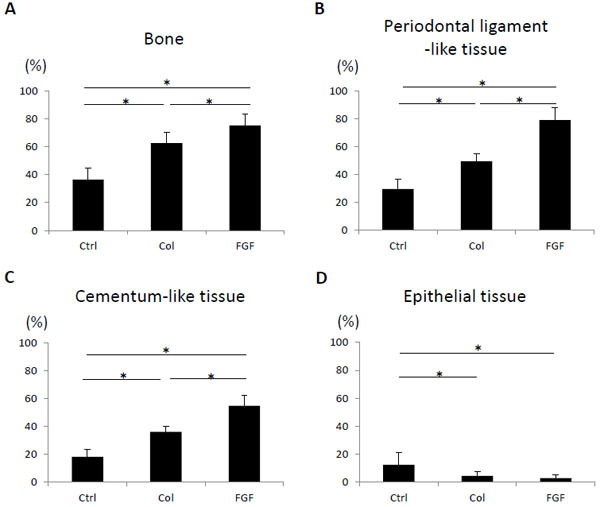 Thus, we hypothesized that a combination of FGF2 and collagen hydrogel scaffold dramatically improved the biological effects for periodontal tissue engineering. Accordingly, we investigated whether FGF2-loaded collagen hydrogel scaffold promoted periodontal tissue healing. Scaffolds were implanted into dog class II furcation defects as preclinical tests to assess the biological effects of collagen hydrogel and FGF-2 application. Collagen hydrogel with a concentration of 1.5% (Fig. 1A) was fabricated using atelocollagen powder from calf skin (Koken, Tokyo, Japan), as described previously . Atelocollagen was dissolved in 1 M HCl, and was stirred for 3 days. Subsequently, crosslinking was performed by adding 1 mM L(+)-ascorbic acid and 0.1 mM CuCl2. 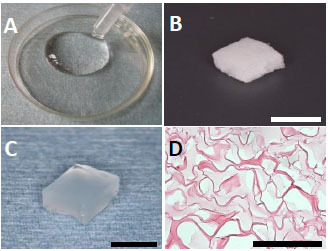 Next, the collagen hydrogel (100 µl) was injected into a sponge form of collagen (5 × 3 × 3 mm, porosity of 97%; Terudermis®; Olympus Terumo Biomaterials, Tokyo, Japan; (Fig. 1B) under vacuum. (A) Collagen hydrogel. (B) Sponge form of collagen. (C) Collagen hydrogel scaffold. (D) Thin-sliced sections of collagen hydrogel scaffold. Penetration of hydrogel (light-stained area) was observed in the sponge form of collagen. Staining: hematoxylin and eosin. (Scale bars represent 5 mm (B, C) and 100 µm (D)). Some scaffolds received FGF2 (50 µg, Fiblast spray 500; Kaken Pharmaceutical, Tokyo, Japan), as described previously . FGF2 was added to collagen hydrogel (100 µl), and the collagen sponge was then infused with the admixture (Fig. 1C). To observe the morphology of hydrogel penetration, sponges injected with collagen hydrogel were embedded in paraffin wax in accordance with conventional methods, then cut into 6-µm sections. Sections were stained with hematoxylin-eosin (HE), and were observed using light microscopy. The Animal Research Committee of Hokkaido University approved the experimental protocols (approval number: 8-255). Six female beagle dogs, aged approximately 14 months and weighing approximately 10 kg, received intramuscular anesthesia with medetomidine hydrochloride (0.1 ml/kg, Domitor; Nippon Zenyaku Kogyo, Koriyama, Japan) and butorphanol tartrate (0.1 ml/kg, Vetorphale; Meiji Seika, Tokyo, Japan). Local anesthesia was induced with lidocaine hydrochloride (2% with 1:80,000 epinephrine, Xylocaine; Dentsply-sankin, Tokyo, Japan). After reflecting the buccal partial-thickness flap, soft tissue including periosteum was scraped from alveolar bone. The creation of artificial buccal class II furcation defects (5 mm in height, 3 mm horizontally) was carried out on the mandibular second, third and fourth premolars (Fig. 2A). After removing cementum using a scaler, bone defect notches were fabricated and the root surface was treated with EDTA (24%, pH 7.0) to remove debris. Thirty-six defects were randomly divided into the three groups. Subsequently, defects were filled with FGF2-loaded or unloaded scaffolds (Fig. 2B) and the repositioned flap was sutured (Fig. 2C). No implantation was performed in the control group. All dogs received postoperative treatment with ampicillin sodium (300 mg/kg, Viccillin; Meiji Seika, Tokyo, Japan) administration for 3 days and plaque control with chlorhexidine (0.5%, Hibitane; Sumitomo Dainippon Pharma, Tokyo, Japan) twice weekly. (A) Class II furcation periodontal defects (5 mm in height, 3 mm horizontally). (B) Implantation of scaffold. (C) Post-surgery. (Scale bars represent 5 mm). Animals were euthanized with sodium pentobarbital (0.5 ml/kg, Somnopentyl; Kyoritsu, Tokyo, Japan). Tissue blocks, including teeth, bone and soft tissue were collected from the wound at 10 days (N=3) and 4 weeks (N=9) after surgery. Following fixation in 10% buffered formalin and decalcification in 10% formic acid, specimens were embedded in paraffin wax in accordance with conventional methods. We then prepared serial 6-μm sections along the mesio-distal plane and applied HE and Masson’s trichrome staining. Histomorphometric measurements of 4-week samples, including area of defect and bone, and length of defect, periodontal ligament-like tissue, cementum-like tissue and epithelial tissue, and exposed root surface (Fig. 3), were performed on five stained sections; center and every 120 µm in the buccal direction, using a software package (Image J 1.41, National Institute of Health, Bethesda, MD). 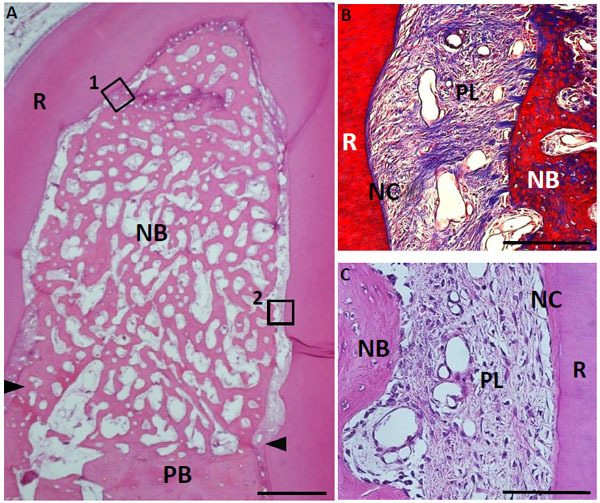 Sections were also evaluated in order to determine the composition of cementum-like tissue (cellular/acellular) and the density of periodontal ligament-like tissue (0 = no fibrous connective tissue; 1 = low-density fibrous connective tissue layer; 2 = high-density fibrous connective tissue layer), using a modified method from the protocol described by Kim et al. .
Histomorphometric measurements. A) Defect area (1) and defect length (2). B) Higher magnification of furcation: area of bone (3), length of periodontal ligament-like tissue (4), length of cementum-like tissue (5), length of epithelial tissue and exposed root surface (6). Each parameter was calculated as a percentage in relation to defect area and length. N: notch. Means and standard deviations of each parameter were calculated for each group. Scheffé’s test was performed for statistical analysis using a software package (IBM SPSS 11.0; IBM SPSS Japan, Tokyo, Japan). P-values of <0.05 were considered to be statistically significant. HE-stained collagen hydrogel scaffold sections are shown in Fig. (1D). Collagen hydrogel was found to penetrate into the sponge form as an amorphous structure. The postoperative healing process appeared to be favorable in all dogs. At 4 weeks, macroscopic findings showed evidence of gingival recession in the control group. FGF2 increased radiopacity in the bone defect (Fig. 4). In control specimens, marked formation of inflammatory granulation tissue was noted in the defect. Furcation fornix was frequently exposed to the mouth and infected by dental plaque accumulation. Alveolar bone and periodontal attachment formation was rarely demonstrated. Epithelial tissue was particularly detected in the coronal portion of the defect (Fig. 5). Radiographic images at 10 days and 4 weeks, and macroscopic findings at 4 weeks post-surgery. (A), (B), (C) Images of control group. (D), (E), (F) Images of collagen hydrogel scaffold group. (G), (H), (I) Images of FGF2-loaded collagen hydrogel scaffold group. Ctrl, Col and FGF indicate control, collagen hydrogel scaffold, and FGF2-loaded collagen hydrogel scaffold, respectively. (Scale bars represent 5 mm). Histological findings in furcation defect at 10 days for control group. (A) Slight alveolar bone formation was observed on the bottom of the defect. (B) Higher magnification image of the framed area (1) in (A). Invasion of epithelial tissue was detected. (C) Higher magnification image of the framed area (2) in (A). Inflammatory granulation tissue was frequently observed at the furcation area. CT, connective tissue; PB, preexisting bone; NB, new bone; EP, epithelial tissue; IT, inflammatory granulation tissue; R, root; arrowheads, apical notches. Staining: hematoxylin and eosin. (Scale bars represent 1 mm (A) and 100 µm (B, C)). In the hydrogel scaffold-treated group at 10 days, the scaffold remained in the furcation defect and cell-rich tissue containing numerous cells and blood vessel-like structures apparently infiltrated into the scaffold. Some alveolar bone formed close to pre-existing bone in the apical portion of the defect. Epithelial tissue invasion was not observed in specimens at either the center or buccal sites (Fig. 6). Histological findings in furcation defect at 10 days for collagen scaffold-treated group. (A) The defect was fully filled with collagen hydrogel scaffold. (B) Higher magnification image of the framed area (1) in (A). Cellular ingrowth into the scaffold was marked. (C) Higher magnification image of the framed area (2) in (A). Alveolar bone was slightly formed in the defect. Col, collagen hydrogel scaffold; PB, preexisting bone; NB, new bone; R, root; arrowheads, apical notches. Staining: hematoxylin and eosin. (Scale bars represent 1 mm (A) and 100 µm (B, C)). Histological findings in furcation defect at 10 days for FGF2-loaded collagen scaffold group. (A) The furcation defect was occupied with collagen scaffold. Alveolar bone induction was frequently demonstrated. (B) Higher magnification image of the framed area (1) in (A). Infiltration of cell and blood vessel-like tissue were apparent in the FGF2-loaded collagen hydrogel scaffold. (C) Higher magnification image of the framed area (2) in (A). Newly formed bone involved many osteoblastic cells and osteocyte-like cell. Col, collagen hydrogel scaffold; PB, preexisting bone; NB, new bone; R. root; arrowheads, apical notches. Staining: hematoxylin and eosin. (Scale bars represent 1 mm (A), 100 µm (B, C)). The FGF2-treated group clearly showed ingrowth of numerous cells and vessel-like structures in the scaffold. In particular, formation of woven bone was promoted when compared with the control and collagen hydrogel-treated groups. Alveolar bone was continuous with apical pre-existing bone and included many osteoblastic cells. Blood vessel-like tissue formation frequently occurred when compared with the control and scaffold alone groups. Although new periodontal attachment was not observed on the root surface, fibrous tissue was accumulated on the root surface. In addition, epithelial tissue infiltration was inhibited, thus suggesting that collagen hydrogel implantation would maintain the regenerative space (Fig. 7). In control specimens, connective tissue was mainly formed in the defect. Repair of alveolar bone and periodontal attachment were limited to the root surface. 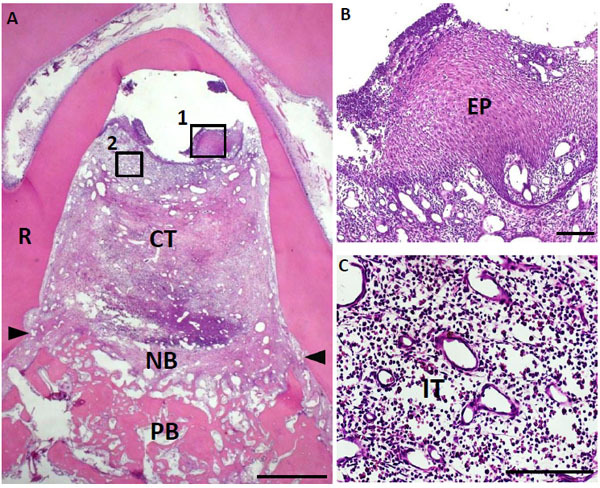 Cementum-like tissue and periodontal ligament-like tissue were not observed on the coronal root surface (Fig. 8). Histological findings in furcation defect at 4 weeks for control group. (A) Alveolar bone was slightly formed at the bottom of the defect. In contrast, connective tissue mainly formed in the defect. (B) Higher magnification image of the framed area (1) in (A). Periodontal ligament-like tissue was rebuilt in the apical area along with new alveolar bone. (C) Higher magnification image of the framed area (2) in (A). Cementum-like tissue was slightly formed in the notch. CT, connective tissue; PB, preexisting bone; NB, new bone; NC, new cementum-like tissue; PL, periodontal ligament-like tissue; R, root; arrowheads, apical notches. Staining: hematoxylin and eosin (A, C) and Masson’s trichrome (B). (Scale bars represent 1 mm (A) and 100 µm (B, C)). In the scaffold-treated group, new bone was generated, in contrast to the control group, and occupied about half the area of the furcation defect. Periodontal attachment continuous with the original periodontal organs, including fiber structures resembling Sharpey’s fibers, was reformed on the instrumented root surface. The interspace for periodontal ligament showed rich extracellular matrix and stained perpendicular fibers. Down-growth of the epithelial tissue was rarely noted. In addition, ankylosis and root resorption were not evident (Fig. 9). FGF2 application strongly promoted periodontal healing. The furcation defect was mostly occupied by newly formed bone. 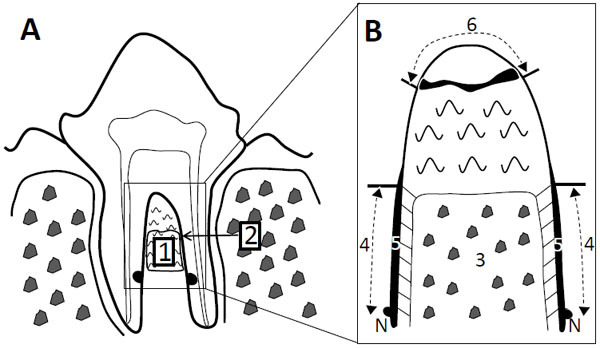 Serial sections showed that alveolar bone was formed at the buccal area of the furcation defect. Periodontal attachment apparatus was clearly observed at every part of furcation. Sharpey’s fibers were well-developed at the interface of periodontal ligament-like tissue, indicating that the re-establishment of functionally periodontal attachment was stimulated. Scaffold loaded with FGF2 suppressed epithelial down-growth and did not induce aberrant healing, such as ankylosis and root resorption (Fig. 10). Histological findings in furcation defect at 4 weeks for collagen scaffold-treated group. (A) Formation of new bone was marked when compared with control group. (B) Higher magnification image of the framed area (1) in (A). Periodontal ligament-like tissue was identified between the newly formed cementum-like tissue on the root surface and new alveolar bone. (C) Higher magnification image of framed area (2) in (A). Periodontal ligament-like tissue, including oriented fibers was detected along with root surface. CT, connective tissue; PB, preexisting bone; NB, new bone; NC, new cementum-like tissue; PL, periodontal ligament-like tissue; R, root; arrowheads, apical notches. Staining: hematoxylin and eosin (A, B) and Masson’s trichrome (C). (Scale bars represent 1 mm (A) and 100 µm (B, C)). Histological findings in furcation defect at 4 weeks for collagen hydrogel scaffold loaded with FGF2. 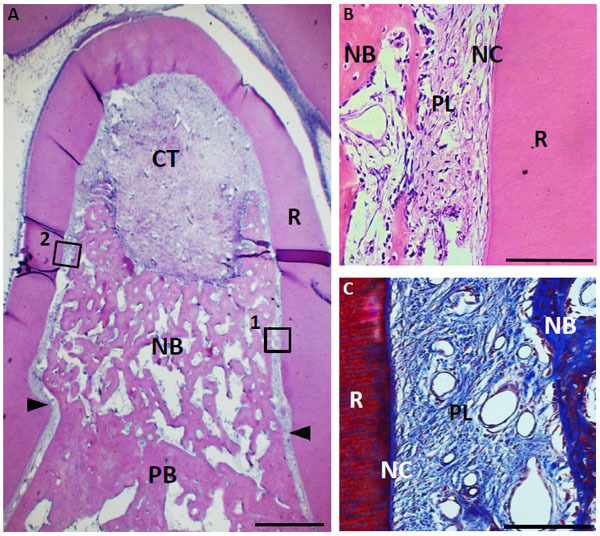 (A) A large amount of regenerated bone was observed in the defect. (B) Higher magnification image of the framed area (1) in (A). Periodontal ligament-like tissue showed a fiber-rich layer. (C) Higher magnification image of the framed area (2) in (A). Cementum-like tissue, resembling acellular cementum, was detected on the root surface. CT, connective tissue; PB, preexisting bone; NB, new bone; NC, new cementum-like tissue; PL, periodontal ligament-like tissue; R, root; arrowheads, apical notches. Staining: hematoxylin and eosin (A, C) and Masson’s trichrome (B). (Scale bars represent 1 mm (A) and 100 µm (B, C)). The degree of periodontal healing is shown in Fig. (11). The FGF2-loaded group showed the most active bone and periodontal attachment forming effects among the three groups. The mean value of new bone area of the FGF2 receiving group was approximately 2-fold greater than in the control group. In addition, reforming of periodontal ligament-like tissue and cementum-like tissue was significantly stimulated by FGF2 application. Down-growth of epithelial tissue was observed in all furcation defects in the control group, but was rarely seen in the hydrogel scaffold-treated and FGF2-treated groups. Therefore, collagen hydrogel scaffold prevented epithelial tissue invasion. At 4 weeks, the collagen scaffold was completely degraded in all groups. Implanted substrate was considered to be quickly replaced by regenerative tissue. Histomorphometric analysis at 4 weeks (N = 9, mean ± standard deviation). (A) Area of bone. (B) Length of periodontal ligament-like tissue. (C) Length of cementum-like tissue. (D) Length of epithelial tissue. Ctrl, Col and FGF indicate control, collagen hydrogel scaffold and FGF2-loaded collagen hydrogel scaffold, respectively. * P < 0.05. In addition, two sections (the central plane and 480 µm away from the central plane) were selected for histometric assessment (Fig. 12). In the buccal section, bone, periodontal ligament-like tissue and cementum-like tissue were reformed in all groups, and these parameters were consistently decreased when compared with the central section. Periodontal tissue reformation in the mid-section was thought to be facilitated by the positive effects of residual lingual wall in the furcation defects. However, implantation of FGF2-loaded scaffold resulted in 70% of periodontal tissue reconstruction, even in the buccal section. In contrast, the buccal section in the control group frequently showed down-growth of epithelial tissue. The frequency of the composition of cementum-like tissue and density of periodontal ligament-like tissue are shown in Table 1. Cementum-like tissue frequently appeared to be acellular cementum and received Sharpey’s fiber insertions. Reformed periodontal ligament-like tissue exhibited fiber-rich connective tissue layer after trichrome staining. In particular, periodontal ligament-like tissue was well-developed in the FGF2-treated group. Frequency of histological observations at 4 weeks after surgery (N = 9, mean ± standard deviation). Histomorphometric analysis of the central and buccal sections (480 μm away from center) at 4 weeks after surgery (N = 9, mean ± standard deviation). (A) Area of bone. (B) Length of periodontal ligament-like tissue. (C) Length of cementum-like tissue. (D) Length of epithelial tissue. Ctrl, Col, and FGF indicate control, collagen hydrogel scaffold, and FGF2-loaded collagen hydrogel scaffold, respectively. * P < 0.05. On histological observation at 10 days, cell ingrowth into the scaffold was frequently detected after implantation of collagen hydrogel scaffold. Further addition of FGF2 strongly promoted cell and tissue ingrowth and subsequent bone formation. Therefore, the combination of FGF2 and collagen hydrogel scaffold intensely enhanced bioactivities for periodontal wound healing. It has been reported that fibroblast proliferation and migration associated with the wound healing process is up-regulated by FGF2 application [23, 24]. Furthermore, FGF2 facilitated the healing of osseous tissue including the osteoblast proliferative process and bone repair [17, 25]. Collagen hydrogel is able to absorb and retain significant amounts of water ; therefore, FGF2 in aqueous solution would be possessed by collagen hydrogel and released via diffusion and scaffold degradation, resulting in bio-effects of FGF2 in periodontal cells and tissues. On the other hand, collagen hydrogel was composed of type I collagen, which is available for the reconstruction of extracellular matrix and connective tissue. Numerous investigators have discussed the potential of type I collagen in cell proliferation and participation in tissue repair [26, 27]. In the present study, ingrowth of periodontal cells was also observed at an early stage with single use of collagen hydrogel, similarly to previous in vivo studies using collagen hydrogel . Thus, FGF2 and collagen hydrogel show promise as new periodontal therapeutic approaches in bio-effective tissue engineering. Four-week specimens of the FGF2-treated group showed that formation of alveolar bone in furcation defects was consistently advanced when compared with other groups. In the 10-day specimens, alveolar bone formation was observed when compared with the control and scaffold alone groups. These results suggest that early bone induction and remodeling are promoted by FGF2 effects. It was reported that FGF2 increased proliferation of vascular endothelial cells and rebuilding of the blood vessel network . In addition, vascular endothelial growth factor (VEGF) was secreted from periodontal ligament cells on FGF2 stimulation . Early ingrowth of blood vessel-like structures was frequently observed in the scaffold containing FGF2 when compared with the group lacking FGF2. We speculated that the FGF2 effect on blood vessel formation would up-regulate bone tissue remodeling. In general, vascularization played a significant role in providing nutrition factors for wound healing and tissue remodeling . Further, mesenchymal stem cells accumulated in the wound via blood vessels in tissue regeneration. Accordingly, supply of vascular elements would be advantageous for bone tissue engineering. Fujimura et al. revealed that higher oxygen partial pressure could enhance bone regeneration . Therefore, construction of the neovascular network at the FGF2 implantation site would enhance cell differentiation of osteoblasts, resulting in new bone induction. It is very important in periodontal tissue engineering to reproduce the periodontal attachment apparatus and alveolar bone simultaneously. 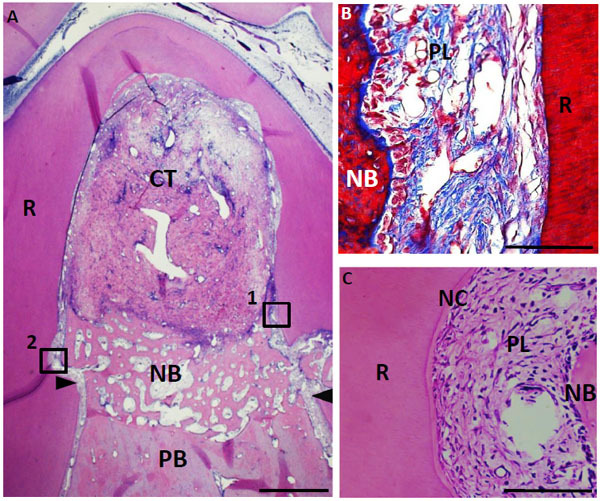 In this experiment, periodontal attachment including periodontal ligament-like tissue and cementum-like tissue was well-formed by implantation of FGF2-loaded scaffold. Although alveolar bone was formed in the furcation defect, there was no ankylotic union on the treated root surface. A previous study reported that the use of FGF2 promoted the growth of periodontal stem cells in vitro . It seems likely that proliferation of periodontal stem cells was promoted by FGF2, and then reconstruction of periodontal attachment was selectively guided along the root surface by interaction between the extracellular matrix and dentin. With regard to FGF2 application, ankylosis was rarely seen in an animal study on periodontal tissue engineering [19, 20]. In contrast, osteogenic growth factor, or bone morphogenetic protein, could be applied for alveolar bone formation [33-35]; however, they frequently resulted in ankylosis or poor organized periodontal ligament . The self-assembling effect of FGF2 would be highly advantageous for periodontal tissue engineering. On the other hand, Kosen et al. demonstrated that hydrogel scaffold prevented epithelial invasion in dog furcation defects. We also noted similar observations in the present examination. The rate of epithelial down-growth in the hydrogel scaffold-treated group was less than in controls, regardless of FGF2 loading. The collagen hydrogel scaffold likely forms a fibrous barrier against epithelial down-growth and results in predictable periodontal healing. Collagen hydrogel exhibited high fluidity; however, the combination with collagen sponge form could hold large amounts of hydrogel in the periodontal defect. In addition, severe inflammation was rarely seen following implantation of the collagen scaffold. Normally, collagen substrate should undergo crosslinking to improve its mechanical strength. In this study, we selected a bio-safe system using the ascorbate-copper ion reaction as the hydrogel cross-linking method , thus ensuring that the gel form collagen maintained good biocompatibility. Furthermore, the collagen sponge consisted of bio-suitable atelocollagen and is widely applied as artificial skin [37, 38]. Low degradable biomaterial remains in periodontal tissue long-term after surgery, increasing the risk of infection or prevention of repair . Histological specimens showed that collagen implants were mostly degraded at 4 weeks post-surgery. Interestingly, Matsui et al. 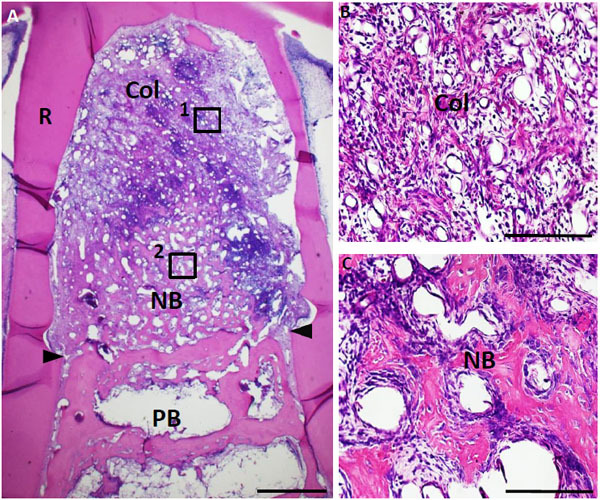 reported that bovine collagen composed of collagen sponge was degraded and then reused for dermal tissue formation in a rat subcutaneous tissue test. Accordingly, collagen scaffold may supply the forming material for reconstruction of periodontal tissue composed chiefly of collagen. This is a significant point for periodontal tissue engineering, but further studies are needed to clarify these biological effects. We evaluated the effects of collagen hydrogel scaffold in combination with FGF2 on periodontal wound healing using a class II furcation defect model. The results showed that healing of alveolar bone and periodontal attachment was strongly promoted by scaffold implantation. In addition, FGF2-loaded hydrogel scaffold consistently suppressed aberrant healing, such as epithelial down-growth, ankylosis and root resorption. The FGF2-loaded scaffold was bioeffective in periodontal tissue engineering. We would like to thank Olympus Terumo Biomaterials Corp. for providing the Terudermis. This work was supported by JPSP KAKENHI Grant Number 22791916 and 25463210. The authors report no conflicts of interest related to this study. Cicciù M, Herford AS, Cicciù D, Tandon R, Maiorana C. Recombinant human bone morphogenetic protein-2 promote and stabilize hard and soft tissue healing for large mandibular new bone reconstruction defects. J Craniofac Surg 2014; 25(3): 860-2. Maiorana C, Beretta M, Battista Grossi G, et al. Histomorphometric evaluation of anorganic bovine bone coverage to reduce autogenous grafts resorption: preliminary results. Open Dent J 2011; 5: 71-8. Park JB. The use of hydrogels in bone-tissue engineering. Med Oral Patol Oral Cir Bucal 2011; 16(1): e115-8. Barralet JE, Wang L, Lawson M, Triffitt JT, Cooper PR, Shelton RM. Comparison of bone marrow cell growth on 2D and 3D alginate hydrogels. J Mater Sci Mater Med 2005; 16(6): 515-9. Cui FZ, Tian WM, Hou SP, Xu QY, Lee IS. Hyaluronic acid hydrogel immobilized with RGD peptides for brain tissue engineering. J Mater Sci Mater Med 2006; 17(12): 1393-401. Hong Y, Mao Z, Wang H, Gao C, Shen J. Covalently crosslinked chitosan hydrogel formed at neutral pH and body temperature. J Biomed Mater Res A 2006; 79(4): 913-22. Hesse E, Hefferan TE, Tarara JE, et al. Collagen type I hydrogel allows migration, proliferation, and osteogenic differentiation of rat bone marrow stromal cells. J Biomed Mater Res A 2010; 94(2): 442-9. Asamura S, Mochizuki Y, Yamamoto M, Tabata Y, Isogai N. Bone regeneration using a bone morphogenetic protein-2 saturated slow-release gelatin hydrogel sheet: evaluation in a canine orbital floor fracture model. Ann Plast Surg 2010; 64(4): 496-502. Ishikawa K, Matsui R, Takano Y, Katakura T. Preparation of biodegradable hydrogel. Jpn J Artif Organs 1997; 26: 791-7. Matsui R, Ishikawa K, Takano Y, Katakura T. Application of collagen hydrogel material onto model delayed closing of full-thickness skin defect wound on guinea-pig. Jpn J Artif Organs 1997; 26: 772-8. Kosen Y, Miyaji H, Kato A, Sugaya T, Kawanami M. Application of collagen hydrogel/sponge scaffold facilitates periodontal wound healing in class II furcation defects in beagle dogs. J Periodontal Res 2012; 47(5): 626-34. Kato A, Miyaji H, Ishizuka R, et al. Combination of root surface modification with BMP-2 and collagen hydrogel scaffold implantation for periodontal healing in beagle dogs. Open Dent J 2015; 9: 52-9. Kodama N, Nagata M, Tabata Y, Ozeki M, Ninomiya T, Takagi R. A local bone anabolic effect of rhFGF2-impregnated gelatin hydrogel by promoting cell proliferation and coordinating osteoblastic differentiation. Bone 2009; 44(4): 699-707. Singer AJ, Clark RA. Cutaneous wound healing. N Engl J Med 1999; 341(10): 738-46. Martin I, Muraglia A, Campanile G, Cancedda R, Quarto R. Fibroblast growth factor-2 supports ex vivo expansion and maintenance of osteogenic precursors from human bone marrow. Endocrinology 1997; 138(10): 4456-62. Zellin G, Linde A. Effects of recombinant human fibroblast growth factor-2 on osteogenic cell populations during orthopic osteogenesis in vivo.. Bone 2000; 26(2): 161-8. Murakami S, Takayama S, Kitamura M, et al. Recombinant human basic fibroblast growth factor (bFGF) stimulates periodontal regeneration in class II furcation defects created in beagle dogs. J Periodont Res 2003; 38: 97-103. 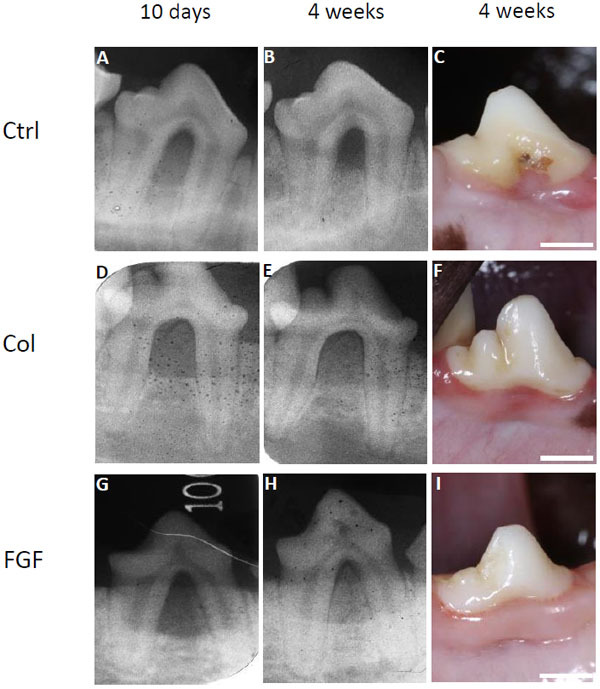 Takayama S, Murakami S, Shimabukuro Y, Kitamura M, Okada H. Periodontal regeneration by FGF-2 (bFGF) in primate models. J Dent Res 2001; 80(12): 2075-9. Kim YT, Wikesjö UM, Jung UW, Lee JS, Kim TG, Kim CK. Comparison between a β-tricalcium phosphate and an absorbable collagen sponge carrier technology for rhGDF-5-stimulated periodontal wound healing/regeneration. J Periodontol 2013; 84(6): 812-20. Gospodarowicz D. Localisation of a fibroblast growth factor and its effect alone and with hydrocortisone on 3T3 cell growth. Nature 1974; 249(453): 123-7. Strutz F, Zeisberg M, Hemmerlein B, et al. Basic fibroblast growth factor expression is increased in human renal fibrogenesis and may mediate autocrine fibroblast proliferation. Kidney Int 2000; 57(4): 1521-38. Debiais F, Hott M, Graulet AM, Marie PJ. The effects of fibroblast growth factor-2 on human neonatal calvaria osteoblastic cells are differentiation stage specific. J Bone Miner Res 1998; 13(4): 645-54. Donzelli E, Salvadè A, Mimo P, et al. Mesenchymal stem cells cultured on a collagen scaffold: In vitro osteogenic differentiation. Arch Oral Biol 2007; 52(1): 64-73. Talley-Ronsholdt DJ, Lajiness E, Nagodawithana K. Transforming growth factor-beta inhibition of mineralization by neonatal rat osteoblasts in monolayer and collagen gel culture. In Vitro Cell Dev Biol Anim 1995; 31(4): 274-82. Klagsbrun M, D’Amore PA. Regulators of angiogenesis. Annu Rev Physiol 1991; 53: 217-39. Yanagita M, Kojima Y, Kubota M, et al. Cooperative effects of FGF-2 and VEGF-A in periodontal ligament cells. J Dent Res 2014; 93(1): 89-95. Aukhil I. Biology of wound healing. Periodontol 2000 2000; 22(22): 44-50. Fujimura K, Bessho K, Kusumoto K, Konishi Y, Ogawa Y, Iizuka T. Experimental osteoinduction by recombinant human bone morphogeneticprotein 2 in tissue with low blood flow: a study in rats. Br J Oral Maxillofac Surg 2001; 39(4): 294-300. Hidaka T, Nagasawa T, Shirai K, Kado T, Furuichi Y. FGF-2 induces proliferation of human periodontal ligament cells and maintains differentiation potentials of STRO-1(+)/CD146(+) periodontal ligament cells. Arch Oral Biol 2012; 57(6): 830-40. Herford AS, Tandon R, Stevens TW, Stoffella E, Cicciu M. Immediate distraction osteogenesis: the sandwich technique in combination with rhBMP-2 for anterior maxillary and mandibular defects. J Craniofac Surg 2013; 24(4): 1383-7. Cicciù M, Herford AS, Juodžbalys G, Stoffella E. Recombinant human bone morphogenetic protein type 2 application for a possible treatment of bisphosphonates-related osteonecrosis of the jaw. J Craniofac Surg 2012; 23(3): 784-8. Herford AS, Cicciù M. Recombinant human bone morphogenetic protein type 2 jaw reconstruction in patients affected by giant cell tumor. J Craniofac Surg 2010; 21(6): 1970-5. Kano Y, Sakano Y, Fujimoto D. Cross-linking of collagen by ascorbate-copper ion systems. J Biochem 1987; 102(4): 839-42. Suzuki S, Kawai K, Ashoori F, Morimoto N, Nishimura Y, Ikada Y. Long-term follow-up study of artificial dermis composed of outer silicone layer and inner collagen sponge. Br J Plast Surg 2000; 53(8): 659-66. Abramo AC, Viola JC. 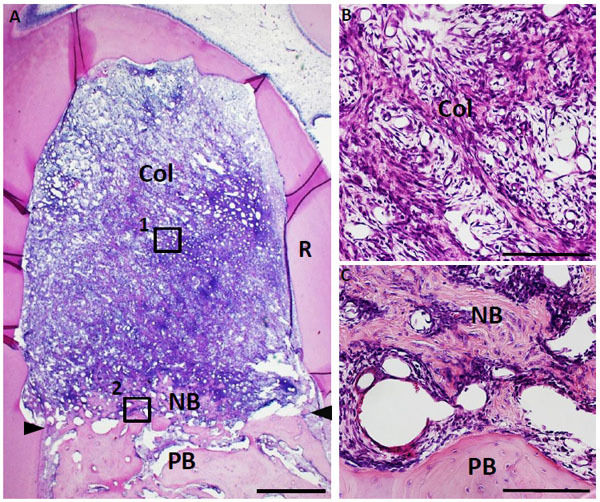 Heterologous collagen matrix sponge: histologic and clinical response to its implantation in third-degree burn injuries. Br J Plast Surg 1992; 45(2): 117-22. 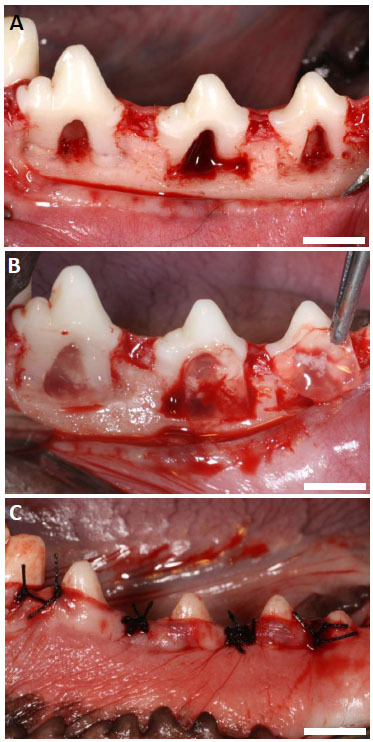 D’lima JP, Paul J, Palathingal P, Varma B, Bhat M, Mohanty M. Histological and histometrical evaluation of two synthetic hydroxyapatite based biomaterials in the experimental periodontal defects in dogs. J Clin Diagn Res 2014; 8(9): ZC52-5. Matsui R, Okura N, Osaki K, Konishi J, Ikegami K, Koide M. Histological evaluation of skin reconstruction using artificial dermis. Biomaterials 1996; 17(10): 995-1000.